"Certainly, America’s sporting zeal changes through the decades, but it’s amazing for a high school graduate of 1963 and a certified sports nut of that era to see what has happened to track and field as a point of interest in this country." "That was a time when the Summer Olympics were little more than an excuse to hold the world’s greatest track meet. Now, television devotes much more of its main-channel focus to swimmers and gymnasts. That’s because the Yanks win more and look really good in their suits in swimming, and those 15-year-old girls are so dang cute as they risk heartbreak on the balance beam. Here’s all you need to know about the United States’ level of enthusiasm for track and field: We have yet to play host to the IAAF World Championships." - Sportswriter Patrick Reusse writing in the Minneapolis Star Tribune on the decline in stature of track and field in the US. Why does my dog lick furniture? USA Champs New Haven 20K Road Race is this weekend - who is running? Does anyone else have a hard time finding women who can even maintain 7-8 min/mile on a typical run? LRC An Incredible Women's 5000m: Dibaba Vs. Defar For $50,000 (And Simpson Vs. Huddle For AR) The matchup track and field fans have been waiting for all year is actually going to take place Thursday in Zürich: World 5,000m champion Meseret Defar vs. Tirunesh Dibaba. 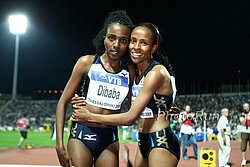 In 2006, Defar upset Dibaba and cost her $125,000. This year the $40,000 DL event bonus is on the line. Also in the race is American World Champ silver medallist Jenny Simpson and American record holder Molly Huddle. Will Huddle's AR go down?